I can’t carry my box to the kerbside – do you offer an assisted service? Assisted collection is a dedicated service that we offer, specifically available for people who are unable to carry their boxes to the kerbside (such as elderly or disabled people). 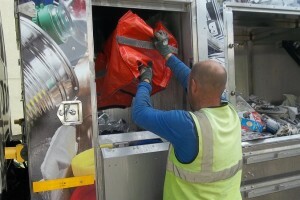 In these cases Wastesavers will offer an assisted service, where the collectors will pick up from specific households. To organise an assisted collection please call us on 01633 281 281. My box has been stolen/My box is broken - how can I get a new one? You can collect a new box from the Re-use Centre, Phoenix Park, off Corporation Rd. Lliswerry NP19 0LW. Alternatively, call us on 01633 281 281 or email mail@wastesavers.co.uk with your address details and what you need and we will deliver to your door. I have run out of food caddy liners – how can I get more? You can collect a roll of caddy liners from any Newport City Council library, the Information Station (by the train station in town), from the Re-use Centre, Phoenix Park, off Corporation Rd. Lliswerry NP19 0LW . Alternatively call us on 01633 281 281 or email mail@wastesavers.co.uk with your address details and what you need and we will deliver to your door. For a full list of library locations click here. You have missed my box – what should I do? Why can’t I just put it all in one bin/bag? By separating the different materials, you are helping to keep them clean and of a high quality. This means that 99.9% of what we collect we can recycle. This method of collection is endorsed by the Welsh Government as it is the most cost effective and efficient method of recycling collection. What do we do with black plastic meat trays? You can place these for recycling in your red bag. How often can we order a roll of liners? On average residents use three bags a week. As such each roll of bags should contain enough bags to last 6 months. To avoid the temptation to use the food waste bags for other things we advise residents that they can reorder a roll of bags every three months. Are we allowed more than one roll of bags? I am afraid we only supply one roll of bags at a time. Are we allowed more than one box? Yes. If you have a lot of recycling and need an extra box or bag contact us pick up a box from the Re-use Centre, Phoenix Park, off Corporation Rd. Lliswerry NP19 0LW. What do we do with our old/broken boxes? Place these outside your house and when we deliver your new boxes we will remove the old/broken ones and recycle them for you.